Nature published three articles on the Sumatra April 2012 mega-strike-slip earthquakes. I am pretty sure that at least one of them will be discussed intensely. 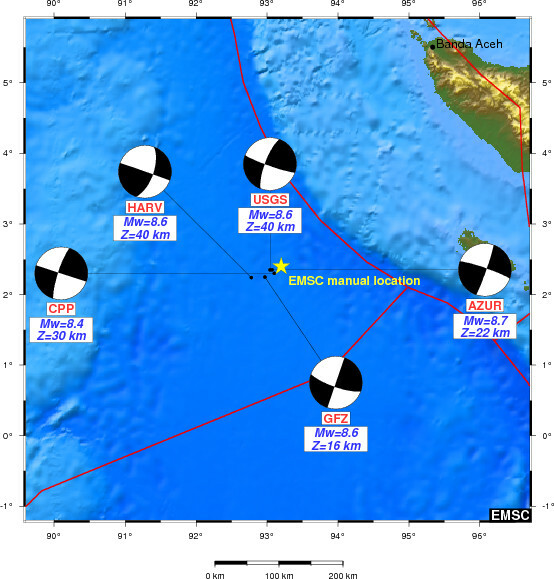 Earlier this year, two earthquakes with magnitudes of M8.6 and M8.2, respectively, occurred in the Indian Ocean off Sumatra. The epicentres were close to the epicentral area of the 2004 Christmas event, but further to the SW and entirely on the Indo-Australian plate. This was surprising for many reasons: We did not expect such strong strike-slip quakes, we did not expect them to happen intraplate, and we were surprised by the complex en echelon and orthogonal fault pattern. Now, Yue et al. (2012) conclude that this is a clear hint for the (already predicted) ongoing formation of a new plate boundary between Australia and India, more or less. Delescluese et al. (2012) describe how the megathrust quakes of 2004 and 2005 helped to built up the stress necessary to cause the 2012 event. Pollitz et al. (2012) will in my opinion face some discussion with their conclusion that the April 2012 strike-slip quake triggered worldwide +M5.5 aftershocks. Clearly, there was a sudden increase in intermediate worldwide seismicity after the event, but the days before the quake were characterized by a very low seismicity level. The authors point out that all aftershocks occurred “along the four lobes of Love-wave radiation” and at place where “the dynamic shear strain is calculated to exceed 10−7 for at least 100 seconds during dynamic-wave passage”. This would that mean that we should re-think our definition of aftershocks as earthquakes occurring locally in the epicentral area of the main shock. Also, I am not sure if the shear strain values can really be considered sufficient for triggering the intermediate quakes. Moment tensor solutions for the first EQ, image from EMSC-CSEM. Yue, H., Lay, T., and Koper, K.D. 2012. En échelon and orthogonal fault ruptures of the 11 April 2012 great intraplate earthquakes. Nature http://dx.doi.org/10.1038/nature11492. Delescluse, M., Chamot-Rooke, N., Cattin, R., Fleitout, L., Trubienko, O., and Vigny, C., 2012. April 2012 intra-oceanic seismicity off Sumatra boosted by the Banda-Aceh megathrust. Nature http://dx.doi.org/10.1038/nature11520. Pollitz, F.F., Stein, R.S., Sevilgen, V., and Bürgmann, R. 2012. The 11 April 2012 east Indian Ocean earthquake triggered large aftershocks worldwide. Nature http://dx.doi.org/10.1038/nature11504. The BBC has published a wonderful set of photographs: Marine microworlds: the private life of plankton. Absolutely worth viewing! The New Zealand Journal of Geology and Geophysics just published a special issue: The 2010–2011 Canterbury earthquake sequence. Unfortunately, only the introduction is open access. New Zealand Journal of Geology and Geophysics, Volume 55, Issue 3, 2012. Dave Petley had an article on very strange features observed in large landslides. The rocks can be transported over kilometers and are then widely disintegrated but, they often still preserve structures from their original position like folds and faults. It’s just like they were in-situ, but then you touch them and they’re crumbling. Strange. 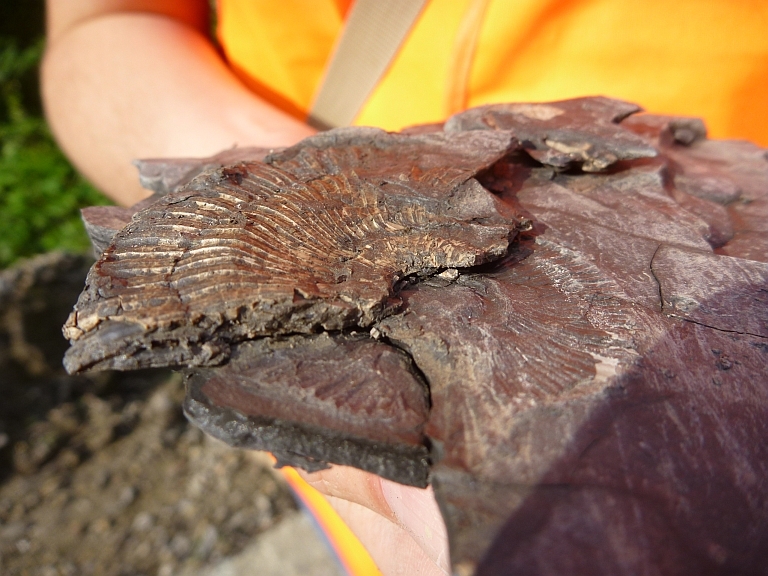 Leioceras opalinum, an ammonite we found in a claystone quarry in SW Germany (Opalinus clay).